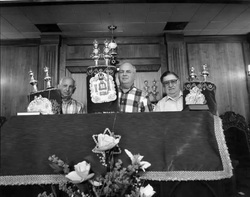 The scattered and small nature of the Jewish community of southeast Arkansas prevented the creation of an official congregation for several decades. The closest congregation was in Pine Bluff, which was not easily accessible from towns like Dumas and McGehee. The few Jewish families who settled in the region would worship together informally in private homes for the holidays. In Dermott, Jews had worshipped under the leadership of Eli Dante for several years, but stopped once he moved away in 1927. By 1940, Jews in McGehee and surrounding towns were worshipping together at the home of Henry Hamburger. As their numbers grew, they used the Missouri Pacific Booster Hall in McGehee and later the Sunday school building of St. Paul Episcopal Church. Two brothers, Sol and David Meyer, would usually lead services. David Meyer and his wife also organized and ran a small Sunday school for Jewish children in the area. The group approached Rabbi Morris Clark in Pine Bluff and asked him to come to McGehee on Sundays to lead services and run the religious school, offering him $50 a month plus car expenses. Rabbi Clark accepted, but once World War II began and gasoline rationing came into effect, he was no longer able to serve the group. The Meyer brothers once again filled the role of lay leaders. In 1946, during a meeting of the local B’nai B’rith lodge, David Meyer proposed that they build a synagogue. Soon after, they officially formed the congregation Beth Chayim (House of Life) which would serve Jews in small towns throughout southeast Arkansas. They soon changed their name to Meir Chayim to honor a local Jew who had died in World War II. David Meyer was chosen as chairman of the new Reform congregation, which soon affiliated with the Union of American Hebrew Congregations. They formed a building committee, and began to raise money for a synagogue. Jews from throughout the region contributed to the building fund, as did congregations in other states. They used some interesting methods to raise the money, including raffling off a car and a $1,000 bill. Without using an architect, the building committee designed the synagogue themselves after studying other temples and churches in the area. Sam Wolchansky donated two lots to the congregation as a site, though other members didn’t like the location and sold them. They then bought two other lots from the McGehee Church of Christ that were more appealing. The construction was delayed by supply shortages brought on by the war. Much of the lumber came from trees cut down on members’ property. Wolchansky managed to find the necessary materials and closely supervised the temple’s construction. The building was completed in 1947, though they didn’t officially dedicate the new temple until 1949. At the dedication ceremony, Rabbi Ira Sanders of Temple B’nai Israel in Little Rock gave the keynote address and other rabbis came from Hot Springs, Fort Smith, Pine Bluff, and Belleville, Illinois. The gothic-style building can seat 150 people in its sanctuary and features ten stained glass windows. Since Meir Chayim was founded relatively late, the congregation was able to use artifacts from congregations that had previously closed. The ten commandments in the sanctuary came from Temple B’nai Sholom in Bastrop, Louisiana, while the ten commandments outside above the front door came from Temple Beth El Emeth in Camden, Arkansas. The small size of Meir Chayim has not prevented it from being an active congregation. Rose Wolff founded a sisterhood in the 1940s. They also had a Sunday school; Elsie Hamburger taught there for thirty-five years. Though they never had a full-time rabbi, they have been relying on student rabbis from Hebrew Union College for over sixty years. Although it has declined to only fifteen members, Meir Chayim still has a student rabbi come to McGehee once a month to lead Friday night services. 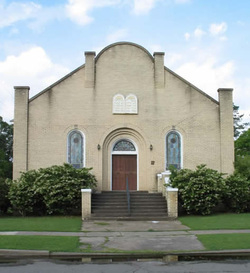 Like other small town congregations, Meir Chayim has been in decline, though it continues to attract Jews from small towns throughout three counties in southeast Arkansas.